Could this opinion, which essentially implies gold is forever down and equities have entered a permanent high, be one of those classic calls at a market turning point? Further, such “this time its different” call believes that central bank manipulation is a practice that can go on in perpetuity. 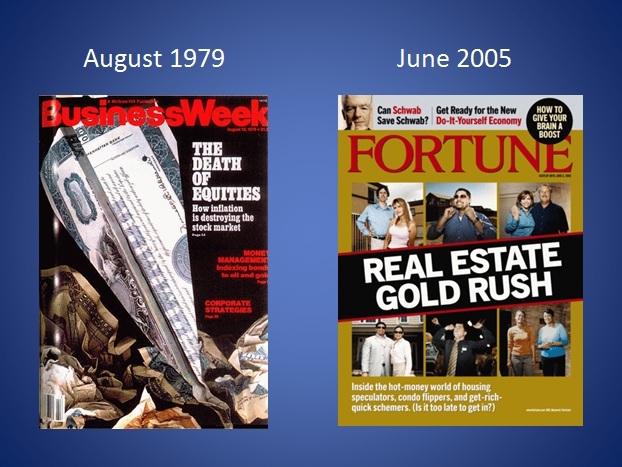 Fortune’s June 2005 cover article of “Real Estate Gold Rush” was taken by some to be indicative of a speculative top and a portent for an upcoming market reversal. Just as Business Week’s famous August 13, 1979 cover story called for the end of the stock markets at the moment when the largest bull run was just getting underway. Gold shined brightly at the beginning of 2014, with bullion prices jumping by about 13% from New Year’s Day until mid-March. But since spring, and particularly since July, gold prices GCZ4, +0.73% have been on the decline. Last week, the precious metal settled near lows not seen since Christmas 2013. So should investors consider this sell-off as an opportunity to buy precious metals on the cheap? Or is gold really tarnished for some time to come? Sadly for gold bugs, it’s the latter. There’s always a big argument for gold as the only alternative amid overpriced stocks, a weak U.S. recovery and a fragile dollar that will collapse at any time. If you want to make those arguments in the face of the facts, feel free to scroll down to the comments section and make fun of my receding hairline. But for those interested in reality, it’s important to note how much those arguments have missed the mark over the past few years and how they ignore recent data to the contrary. The stock market, U.S. economy and the dollar are all doing quite well. Judging by recent data, all three look like they will improve. The dollar is strong: The U.S. Federal Reserve has been telegraphing its moves for some time, and last week reiterated that October will bring about the end of its bond-buying program and that key interest rates will almost certainly rise in 2015. Higher interest rates will only bolster the U.S. dollar further. And thanks to the inverse relationship between our currency and the pricing of dollar-backed commodities, a stronger dollar means gold prices will fall. After all, a big reason for gold’s trouble in recent months has been a strengthening greenback. After the Fed news, the dollar is now at a 14-month high vs. other major currencies. This will continue to put downward pressure on gold prices. It’s not just our central bank fueling this trend, either. The European Central Bank, for instance, unexpectedly just cut rates and announced a stimulus plan despite opposition from Germany. Similarly, Japan has been maintaining loose policies to weaken its currency and drive up inflation. As other central banks weaken their currencies, the dollar gets an added boost there as well. Now, I know there are gold bugs who like to talk about the death of the dollar. But with other central banks actively debasing their currency and America on the cusp of tightening monetary policy, well, I simply don’t see how we can expect anything but a strong dollar for some time. A strong dollar adds up to weakness for gold, so this is a big hurdle to get over that can’t be ignored. “Risk on” sentiment: You can shout all you want about how the Federal Reserve has destroyed capitalism for good, or how being the best among a group of doomed currencies is not a vote of confidence for the dollar. But even if you want to ignore the relative strength of the greenback, it’s getting increasingly harder to ignore the strength of the U.S. economy. There’s a 6.1% unemployment rate, which is down nearly 4 percentage points from peak levels and the lowest since September 2008. At the same time, claims for unemployment just hit the lowest level since early 2007. If you think that is all because of people giving up on work, that’s willfully naïve. Corporate profits also look robust. According to research firm FactSet, the estimated earnings growth rate for the third quarter is 6.2%, with most analysts predicting double-digit growth in the fourth quarter as the economy continues to bounce back from a sluggish summer. And for calendar 2013, S&P 500 member companies saw earnings grow about 6%. There are clearly real profits being made by publicly traded companies right now, justifying investors who are paying a premium for future growth. There’s tons of other data that indicates the U.S. economy and corporate profits continue to improve. So why would investors flee stocks or other “risk on” investments to hide out in gold? Sentiment just isn’t in favor of safe-haven investments like gold right now. Global demand slumps: Looking beyond U.S. borders, global demand also is bleak for gold. China, which overtook India as the largest gold-buying nation last year, has recently seen demand for the precious metal slump sharply. But according to reports, that buying frenzy of 2013 has evaporated as demand has largely been met; China’s gold-jewelry fabrication was down 22% in the first half of the year. On the whole, the World Gold Council announced that global gold demand was off 16% in the second quarter, with total bar and coin demand down a staggering 56%. If you think that seasonal jewelry demand around the Chinese New Year is going to make up for this broader downtrend, go ahead and buy gold. But given the severity of demand pressures and the widespread nature of the declines, it’s very unlikely that global gold buying will snap back anytime soon.